Having a monthly period exposes every woman to the possibility of menstruation-related illnesses like the Toxic Shock Syndrome (TSS). This serious disease which can be fatal is most of the time a result of the use of the conventional sanitary pads or tampons. These period products contain chemicals that can possibly lead to TSS. Thank Heavens for the invention of all-natural or organic menstrual products, particularly the BB2 Bamboo Water Resistant Pads. It is because of these non-chemical menstrual pads that this can be avoided. Also consider using a menstrual cup such as the Lena Cup instead of tampons! The BB2 Bamboo Water Resistant Pads is a highly recommended period product on Amazon today. It is a reasonable price considering its non-chemical content that saves every woman from the killer TSS. Each pad in the pack is made of absorbent and soft bamboo material for dry feel. As a result, the strong absorbency feature makes the pad leak- and stain-proof all the time. It has a water resistant outer layer for optimum protection. Not only that! These water resistant pads are longer than the usual to offer you comfort and convenience during heavy-flow days. Those with extremely heavy menstrual flow might need the support of a menstrual cup. Some find it too thin to use during heavy flow days. One needs to spend extra cost for the shipment. Can I Swim in these Reusable Cloth Pads? When you hear the words, “water resistant,” you may want to know if these pads are suitable for swimming in. The easy answer is no! They are designed to catch leaks from your period (on incontinence/vaginal discharge), but not to keep water out from the outside. For swimming, you have a few different options including tampons and menstrual cups which are worn internally. Or, you might want to consider the Modibodi swimsuit, which has padding that can hold around the same amount as an average tampon. It’s high time that you become conscious about your health. Don’t let TSS strike you. Switch to organic and spend worry-free days on your entire menstrual cycle. The BB2 Bamboo Water Resistant Pads are shaped perfectly as if you’re using a regular sanitary pad. It’s not bulky so you won’t feel any inconvenience bringing it anywhere. You don’t have to worry about the skin type you have because the material these pads contain is hypoallergenic. Imagine yourself in the middle of a strenuous activity and you have your period. Isn’t it amazing and exciting? You can make this happen if you opt for the BB2 Bamboo Water Resistant Pads. They’re long and wide so they guarantee to protect you from the embarrassment of stains and leaks. Don’t wait for a long time now especially that you have all the chances and the time to make a purchase. 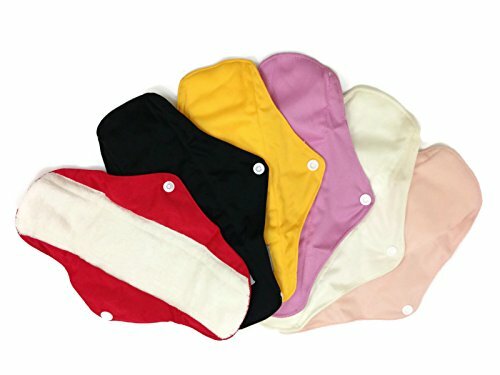 What are your thoughts about the BB2 reusable cloth pads? Leave a comment below and let us know what you think. Also be sure to give this article a share on Facebook, Twitter, or Pinterest.